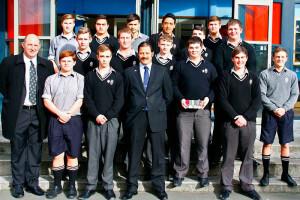 The Leadership Programme was introduced to Palmerston North Boys’ High School in 2006, along with the appointment of a Leadership Director. The programme has seen increased opportunities for student leadership across both curriculum and co-curricular areas, as well as responsibility within programmes such as peer mentoring and tutoring. This has seen increased opportunities for students to develop in character and confidence as they have progressed in to the senior school. Increased involvement in school and community service, as well as the full suite of pastoral, sports and cultural activities our young men undertake on their journey to becoming educated men of outstanding character also continue to contribute to developing their character and confidence. 2015 marks a decade of character education and the Leadership Programme continues to positively shape our young men in a world where the challenges facing our young men are never ending. The PNBHS Leadership Programme aims to provide assistance to developing an educated man of outstanding character by developing each young man in not only his knowledge (education) but also in the key areas of his confidence and character. 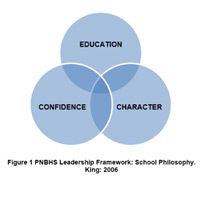 PNBHS Leadership Programme will provide all young men with progressive leadership training that will develop their character and provide them through experiential learning with the confidence to assume leadership roles in the school, or be an effective follower. It will provide young men with a firm basis from which to grow into an effective leader or follower in their post-secondary education and career to meet the challenges in their life beyond school. A young man leaving the school who is confident, positive, and proactive who is known for his good character. Those who encounter him will see him stand out as having the potential to be a future leader or hard working contributor in whatever path he decides to follow. • integrity, which involves being honest, responsible, and accountable and acting ethically and to respect themselves, others, and human rights. This competency is associated with self-motivation, a “can-do” attitude, and with students seeing themselves as capable learners. It is integral to self-assessment. Students who manage themselves are enterprising, resourceful, reliable, and resilient. They establish personal goals, make plans, manage projects, and set high standards. They have strategies for meeting challenges. They know when to lead, when to follow, and when and how to act independently. Student goal setting and follow up has been identified as a key focus area. Relating to others is about interacting effectively with a diverse range of people in a variety of contexts. This competency includes the ability to listen actively, recognise different points of view, negotiate, and share ideas. Students who relate well to others are open to new learning and are able to take different roles in different situations. They are aware of how their words and actions affect others. They know when it is appropriate to compete and when it is appropriate to co-operate. By working effectively together, they can come up with new approaches, ideas, and ways of thinking. This competency is about being actively involved in communities. Communities include family, whānau, and school and those based, for example, on a common interest or culture. They may be drawn together for purposes such as learning, work, celebration, or recreation. They may be local, national, or global. This competency includes a capacity to contribute appropriately as a group member, to make connections with others, and to create opportunities for others in the group. Students who participate and contribute in communities have a sense of belonging and the confidence to participate within new contexts. They understand the importance of balancing rights, roles, and responsibilities and of contributing to the quality and sustainability of social, cultural, physical, and economic environments. School Mission, Vision and Values – the cornerstone of an effective Leadership Programme is a complete understanding of these aspects of the school ethos and culture. These are to be discussed with all students. They are to be promulgated and communicated using a range of mediums including: Daily Assemblies; Learning Leadership for Year 9 and 10; Student Diaries and Workbooks; Staff and Prefect and senior student/Form Class role modelling; and the school website. Learning Leadership (LL) – This four year progressive formal leadership programme written for and designed to be taught in secondary schools is written by Dr Timothy Hawkes, the Principal of The Kings School in Sydney. This will be delivered by the Leadership Director to the junior school in seminar fashion on a frequency of twice per term, and to Year 11/12 through the Barrowclough Programme in three seminars in Terms 1-3. The details for delivery are contained at Annex C. The Prefect group in 2014 commenced a new initiative to deliver leadership presentations to Year 9 classes, an initiative from their yLead experience in 2013. The Prefect group in 2015 intend to continue with this initiative. Leadership 101 – this will be delivered to Year 13 students on application through the Recreation Programme in Terms 1 and 2 – it is compulsory for all Prefects; covers individual profiles utilising Myers Briggs (MBTI) and Neethling Brain Instrument; introduces leadership theory, leadership styles, personal values, decision making, and ethics. Barrowclough Mentoring and Goal Setting – the Leadership Director provides the direct mentoring to senior school students in Year 11-13 for individual mentoring and goal setting as required. Prefect Development – the Leadership Director has joint responsibility with the Deputy Rector for and oversight of the development of the senior leaders in the student body. Project Inspire – young men are referred to the Leadership Director as required by Deans, Student Support Services Staff and Senior Management for assistance to reach their potential. Project Ascend – young men have mock interview boards arranged with relevant staff representing interview processes to prepare them for interviews for post-secondary placement in educational and other institutions. Project Tutor/Mentor – assistance as required with the community service and PNBHS Mentoring Programme to allow senior students to provide tutoring, mentoring and role modelling to junior school students. Project Leader Watch – coordination of an objectivised assessment of all young men in the school to identify the natural leaders in the school so as to provide advice to senior management when appointing leadership positions in the school. School and Community Service – it is recognised that service based or “servant leadership” has and will continue to be a major component of life at PNBHS. The cornerstone for such leadership finds its roots in the manner in which the school best serves the community in which it lives. This will continue to be developed through the Barrowclough Programme in 2015. Mentoring – Selected Year 13 students, including Prefects will be invited to volunteer to mentor Year 9, 10 and Year 11 Form classes. Our senior students are leading the school and their peers well. 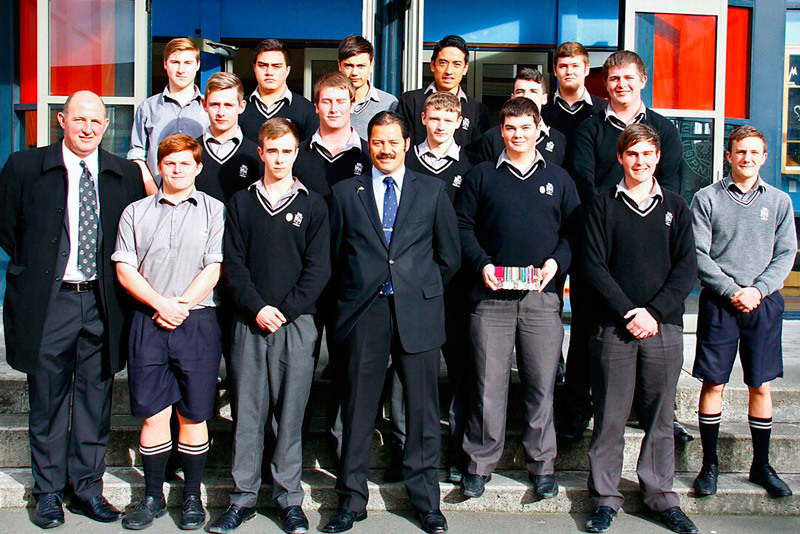 The school award of “National School of Character” by the New Zealand Foundation for Character Education provides evidence that the work of the Leadership Programme and character education in the school per se are developing educated men of outstanding character for our society. Our collective challenge continues to be to build on this firm foundation and to take it to the next level. Role modelling, goal setting and encouraging our students at all levels to reach the next level of excellence is required. It is our belief that high levels of expectation, consistency and positive reinforcement of our values and vision provide the key to success. Domain 1: Education. Curriculum driven based on providing each young man with the highest level of education he can attain: Social Sciences, Technology, Science, Mathematics and Statistics, Learning Languages, English, Health and Physical Education, and Arts. Core subject teachers all play a vital role in communicating the core values of the school and will also be expected to facilitate Learning Leadership Books 1-4. Domain 2: Character. The aim of this domain is to develop the “outstanding character” piece of the educated young man. Core values form the backbone of this aspect and the ethos and values of the school will shape the young men who pass through the school. Positive role modelling is an essential component to the character development of each young man. Domain 3: Confidence. Finally, the aim of this domain will be to develop a young man’s confidence to stand tall whilst he is in, and after leaving school. Self-confidence, self-control and self-awareness will be fostered using a range of methods to develop the communication skills of each young man through curriculum subjects as well as through such mediums as mentoring, goal setting and formal training in physical social teaching to develop self confidence in each young man. The school will deliver many opportunities on the journey through school to gain confidence to begin life after school.